Starring: James Craig, Gloria Talbott, Lon Chaney Jr.
Tag line: "50 FT. HIGH MAN-THING in a land of NATURE GONE MAD!" Over the course of his career, director Bert I. Gordon made a number of films featuring giant radioactive monsters, including Beginning of the End, The Amazing Colossal Man, Earth vs. the Spider and Empire of the Ants. 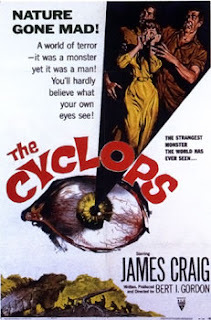 The Cyclops, a 1957 black and white horror / sci-fi flick, is yet another example of Gordon’s penchant for huge creatures, and while I did have some issues with the movie, the monsters themselves were impressive. Utilizing the special effects that were available to him at the time, Gordon fills The Cyclops with a number of gargantuan creatures, including two lizards (who fight each other to the death), a tarantula, and my personal favorite, a 12-foot-tall hawk that snacks on a giant rodent. Even more imposing is the cyclops itself, a deformed humanoid (with one good eye) that towers over the main characters. Though primitive in nature (it grunts and snarls continuously), this cyclops does occasionally show signs of intelligence (instead of crushing the plane that Susan and the others arrived in, he studies it, as if recalling something from his own past), causing us (and the main characters) to wonder whether or not he is truly a monster. While the other mammoth-sized creatures were indeed extraordinary, the cyclops was, without a doubt, the best of the bunch. It’s a shame that Gordon didn’t dedicate as much time to instructing his actors as he did the special effects. The normally reliable Lon Chaney Jr. goes a bit overboard as the slimeball Marty (at one point, he tries to convince Lee to fly him to safety, leaving Susan and Russ behind), though I give him credit for at least trying. Gloria Talbott, on the other hand, shows no life whatsoever as the woman supposedly risking it all for love (she barely reacts when a giant monster pops into view; and often delivers her lines as if she’s reading them off a cue card). Usually a strong actress (she was great as the selfish daughter in Douglas Sirk’s All That Heaven Allows), Talbott looked bored throughout The Cyclops, and her lack of energy bogged down scenes that might have otherwise packed a punch. The acting aside, The Cyclops is a decent giant monster movie, created by a man who, over the years, would become an expert in that particular sub-genre.